I love throwing parties. I really don’t need an occasion – I mean, the second Saturday of the month after a full moon is good enough for me. Or celebrating the arrival of summer, which might actually be on its way to Minnesota after a long visit to other hemispheres. Any excuse is a good one, in my book. 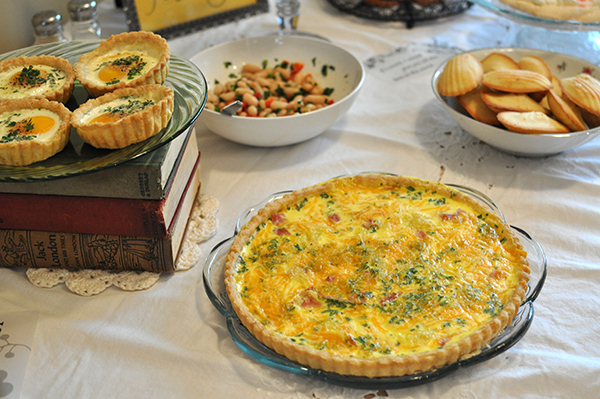 My favorite meal of the day to host a party is definitely brunch. It’s not too early in the day, but not too late. On a weekend, you can get brunch in before you have to mow the lawn or shop for new sandals or all the other things we try to cram into two short days. Put the party on the deck or patio and you have perfection, in my opinion! 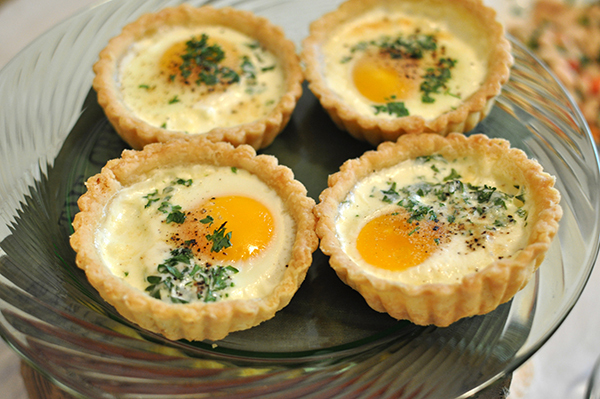 In a sweet spot between breakfast and lunch, brunch can be such a versatile meal. You can go so many directions: ethnic, traditional breakfast foods, more savory options or whatever suits your fancy. There are very few rules for brunch. Feel like grilling? Do it. Want to pig out on carbs? Make or pick up a wicked awesome assortment of baked goods. 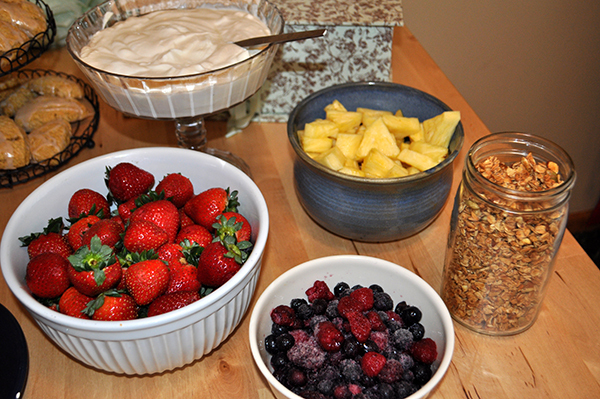 So many things can be prepared the day before or even two days ahead, which is another reason I love hosting brunches. Then I’m not slaving away in the kitchen for hours just before people arrive or even working on much while they are there. The egg dish is best baked in morning, and scones taste better freshly baked, but both can be prepared and waiting in the fridge the night before. You could also ask your guests to contribute to the meal – have a friend bring a bottle of champagne for mimosas; ask your sister to grab fresh croissants from the bakery. Decorate with fresh flowers, spread a nice tablecloth on the deck table, pull out your favorite dishes and celebrate! Enjoy the lovely weather, family and friends and all the best things that make life worth living. Toast the oats. Spread them on a cookie sheet and bake at 375 degrees F for 8-10 minutes or until they are fragrant. Remove from heat and let cool. 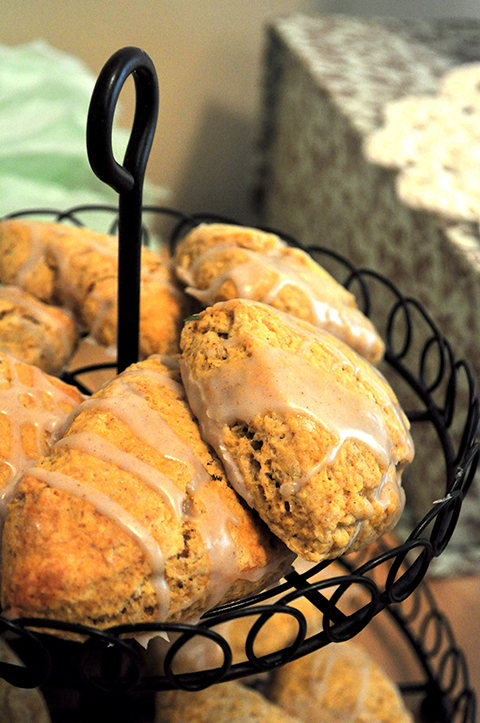 Set aside 2 tablespoons of oats to use as scone topping. Raise oven heat to 450 degrees F.
In a food processor, combine the flour, sugar, baking powder, salt and cinnamon. Pulse 4 times to mix. Add butter chunks to flour mixture and pulse until mixture is the size of small peas. In a mixing bowl, whisk together the egg, cream, milk, and vanilla. Spoon out 1 tablespoon and set aside. You will use this for brushing tops. Add the flour mixture and the oats to cream mixture and stir until almost mixed. On a lightly floured surface, shape the ball into a 7 inch circle (about 1 inch thick). With a floured knife, cut into 6 or 8 wedges, and place wedges 2 inches apart on a non-stick or parchment lined baking sheet. Brush with reserved cream mixture and sprinkle with reserved oats and if desired, some sparkling sugar and extra cinnamon. Bake 14 minutes, rotating pan halfway through. Preheat oven to 450°F. Spray a jelly roll pan or cookie sheet with sides with non-stick cooking spray. Crumble hash browns over pan; press gently into an even layer. Sprinkle half of the cheese evenly over hash browns. Bake 13-15 minutes or until crust starts to brown and cheese is melted. Meanwhile, whisk cream cheese until smooth. Gradually add eggs and black pepper; whisk until smooth. Coarsely chop ham, and slice green onions, reserving 1/4 cup of the tops for garnish. Sauté the ham and remaining green onions on the stove; stirring over medium heat 2-3 minutes or until hot. Stir ham mixture into egg mixture. Remove hash brown crust from oven and pour the egg mixture over crust. Return to the oven; bake 8-10 minutes or until center is set. Meanwhile, dice tomatoes. Remove pan from oven; top with remaining cheese, tomatoes and reserved green onions. Sprinkle with additional black pepper, if desired. Cut into squares and serve.